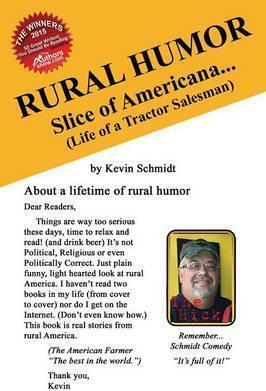 Rural Humor: Slice of Americana... (Life of a Tractor Salesman) by Kevin Schmidt is about a lifetime of rural humor. Dear Readers, things are way too serious these days, time to relax and read! (and drink beer) It's not Political, Religious or even Politically Correct. Just plain funny, light hearted look at rural America. This book is real stories from rural America. Voted WINNER - "50 Great Writers You Should Be Reading" by TheAuthorsShow.com. Kevin Schmidt was born in 1959 in Wyandot Memorial Hospital to Virginia and Richard Schmidt. He has lived in Lovell, Ohio his entire life (other than five years when he was first married). It took him a while to get his wife to move out in the sticks from the big city of Upper Sandusky (pop. 6,000). His family came here and settled from Germany in the 1850's in Lovell, so he has not moved very far. He has been blessed to work in his family business his entire life. There is nothing better than working with family and farmers. No kidding! Kevin has three wonderful daughters, two good sons-in-law, two good grandchildren, and a wife of twenty-eight-plus years, who deserves a medal for putting up with him. He's the last person anybody would ever thought would have written a book. Hopefully his different and unique sense of humor, which his wife and daughter think is warped, will come through. He truly believes humor can be found in almost every situation. It is easy to find problems in everything, but look hard and find the humor, and you will be much happier.